??? Windows Live Messenger Sign in Problems: THE TRIGGERS? Below, there are some Troubleshooting Steps that may help resolve it. you can go to Start, click Run, type control timedate.cpl , and then click OK. In the Date and Time Properties dialog box, confirm that the date and time settings on the computer are correct, and then click OK.
2. Check your Firewall Settings! Enable Windows Live Messenger through your Firewall. c. Select msnmsgr.exe and add it to the list of applications allowed to access the Internet through your firewall application. Older version of Windows Live Messenger, the msnmsgr app location is in "C:\Program Files\MSN Messenger\msnmsgr.exe". WLM 8.5 and later, the msnmsgr app location is in "C:\Program Files\Windows Live\Messenger\msnmsgr.exe". 3. Check your Internet Explorer settings! b. Go to Tools > Internet Options > Advanced tab. c. Under Security, uncheck the Check for Server certificate revocation (requires restart) check box. d. Click OK. and Exit Internet Explorer. 4. Check your Windows Explorer settings! Delete the Windows Live Contacts folder and Messenger cache. This will make sure that the locally stored information related to your account is refreshed on Windows Live Messenger. b. Go to Tools > Folder Options. Before doing these steps, make sure to exit Windows Live Messenger and that it is not running on the background. - Open "Task Manager" Start and then Run. Type taskmgr.exe and click OK.
- Check whether the msnmsgr.exe is running on Processes. If it is, select the application and click End Process. If you are prompted, click Yes. Try running the application as an administrator. Clicking on the messenger shortcut, selecting properties and checking the "Run as administrator" box. Re-open Windows Live Messenger and try to sign in again, and verify if the issue remains. Older version of Windows Live Messenger, the msnmsgr app location is in "C:\Program Files\MSN Messenger\msnmsgr.exe"
WLM 8.5 and later, the msnmsgr app location is in "C:\Program Files\Windows Live\Messenger\msnmsgr.exe". b. Go to Organize > Folder and Search Options. d. press ENTER, a message will appear: "Operation Completed Successfully"
e. Restart your computer and DEP should be disabled. If you're using WindowBlinds (read my previous post: How to Transform Windows XP Skins-Visual-Styles-Themes to Vista with WindowBlinds), you'll need to exclude the WLCOMM.EXE application from WindowBlinds, because Windows Live Communication Platform (WLCOMM.EXE) works only with the standard Windows screen. 2. Under "Change the look of a particular application", click "add per application setting"
4. check mark: "Ignore this application and do not skin it", click OK.
5. Under WindowBlinds Configuration > "Apply my changes"
6. ..and DONE! just restart your Windows Live Messenger 2009 and sign in. That works for me, If it doesn't work for you, you can follow the steps appropriate for your computer's Windows Operating System above/below (Option A., B., and E.) that may help resolve the problem. a.Most users with some Asus board with an NVIDIA chipset are going to have the option to install the NFWNAM (NVidia ForceWare Network Access Manager). Unfortunately, it has some sort of firewall built into it that could stop you from connection correctly to MSN. Try to Uninstall NVidia ForceWare Network Access Manager from control panel Add / Remove Programs, then Restart your computer. b. nVidia MediaShield might also cause this problem in Vista. You can try to uninstall it. d. Try to select it to run in windows 95/98 compatibility mode and "Disable visual themes"
Move it somewhere safe like My Documents. and then Reinstall a FRESH version of Windows Live Messenger! IF ALL of above doesn't work for you, THEN your computer might been infected by virus/spyware/malware.. I hope the solutions above fixed your problem with Windows Live Messenger sign in. Good Luck! 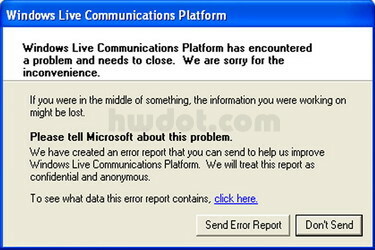 27 comments on "How To Fix Windows Live Communication Platform error? (Windows Live Messenger Sign-In Problems)"
thanks for your thorough article, I'm now able to sign in. Thanks for the help it fixed the problem. Awesome thanks for the comments fellas, mine was Windowblinds too. It was driving me nuts! yea i tried every thing its not working..
ive also tried everything and nothing workerd, is there anything else i can try? Removed Contacts and the old msnmsgr.exe .. When I tried your bcedit - the command prompt said that this was not an internal commando .. i thought at first that maybe I wrote it the wrong way or put a space somewhere .. but nope.. still the same answer..
would appreciate if you knew any other solution to this.. I have not had any problems for a year - and suddenly they just appear after I chose to uninstall MSN Messengers mail service. I have no wldlog.dll on my computer - and YES I already have the settings view hidden system files.. etc..
Hi, now I have tried all of your suggestions above, except for those that did not apply to my computer. I have scanned my system for viruses with Avast and it is clean. Nvidia - uninstalled and restarted. MSN - installed it again - and it installed everything but messenger and now I can not find the uninstall file so I cant uninstall it or reinstall it. I went in to the regeditor and took all keys away for messenger, I have done this before for other programs that had no uninstall file and it removed the program completly. That did not work either. I did not have system restor active, since some viruses takes advantage of that - i do lot of backups instead. I do not think you can help me, but if you can find a way around this, that would be helpful. Thank you for all your input on this page, although it didnt help me, i am happy it helped a lot of others. 2. Locate the wlcomm file, and right click on it. 5. Under the Display settings make sure the box is checked for disabling visual themes. People should not be going in a deleting dll's for any reason. You can really mess up other programs, and how they operate. I can't believe it was even a suggestion. Remember, some people are not as pc savvy as others. Hope this was a help in resolving your issue. It worked for me. One simple way that works for any software problem is restore to an earlier restore point before the incident using the built-in System Restore. Then you are able to log into MSN messenger 2009. It did not work for me, all that remains is: Windows Live Communications Platform has encountered a problem and needs to close. i tried all the steps... is still not working for me... what else i can do to solve the problem... is really very headache!!!! !